Carter Worthington IV enjoyed his solitude. He was able to conduct his research and writing without the fanfare of fame. In fact, he needed to continue with his work, but Hurricane Julia had disrupted more than just his yard. His cantankerous neighbor George Grimbel had insinuated himself into his house. That was just the beginning. Mr. Grimbel's granddaughter Tiffany Breeze and a dog were also in his home. Not that he minded Tiffany. In fact, he quite enjoyed having her around, even if she considered the hero of the novels he wrote a bit unemotional. Unfortunately, that seemed to personify the two of them. Carter, who had never had a nickname, lived a bit of a sterile life, whereas Tiffie embraced life with a vengeance. Carter quickly realized that he enjoyed having Tiffany in his life, but worried that she wouldn't be able to accept the un-impulsive man that he was. 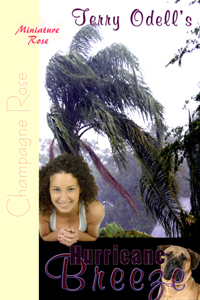 Hurricane Breeze was truly an enjoyable short story. I simply adored Carter, which is probably because the book was written from his POV. I loved his observations, and how he wanted so badly not to be hospitable, yet his home was filling up with a neighbor he didn't get along with, that man's granddaughter, who was a stranger to him, and a dog. And he didn't really like dogs. Yet this shows exactly the type of man that he was.